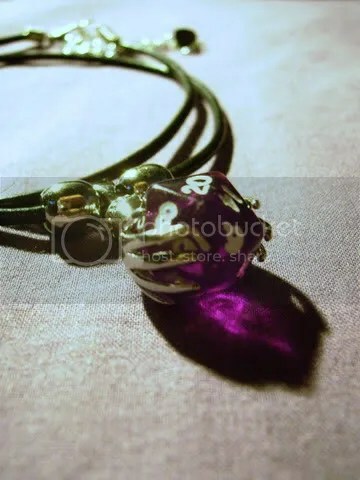 This particular pendant is from a collection I have up for sale and was made from a single pearlescent Pearlized Purple mini-d20. 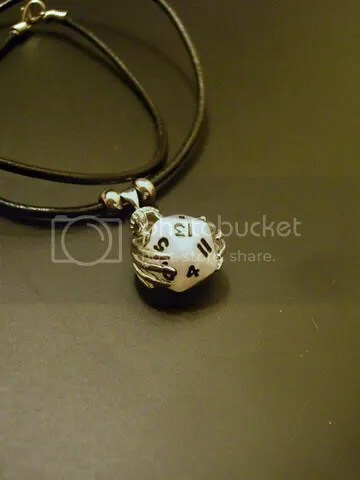 The die does not fall out of the clasp, and is held securely with just a little space for movement. The die kinda looks like it just jumped out of an oyster, tinted a light shade of purple and into my toolbox. I had intended to make a few of these for my bridesmaids when I hold the wedding reception in June. I think it’d make a pretty gift, no? And since most of them like purple, I figured it’d be just perfect. 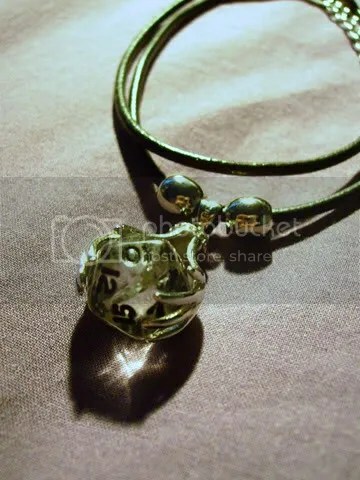 This pendant is from a collection I have up for sale and was made from a single crystal clear Transparent White mini-d20. The die does not fall out of the clasp, and is held securely with just a little space for movement. The die sparkles almost like real crystal when caught in the light. This particular die was actually a failed attempt at drilling the plastic, but it was mostly unharmed and I just *had* to reuse it for something else, they were just too pretty to let go of. 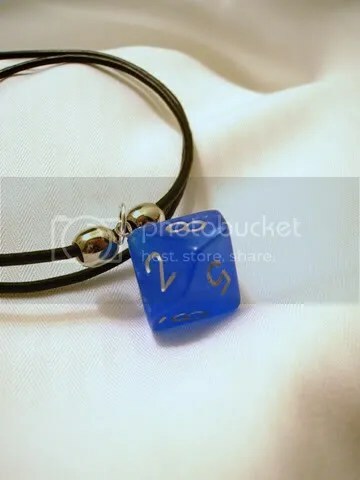 Also considering Koplow Games does not make transparent mini-d20’s anymore, it’s increasingly difficult to find them in retail. Or anywhere else for that matter. 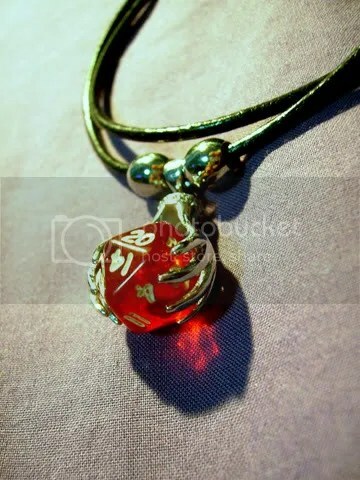 This pendant is from a collection I have up for sale and were made from a single crystal clear Transparent Red mini-d20. 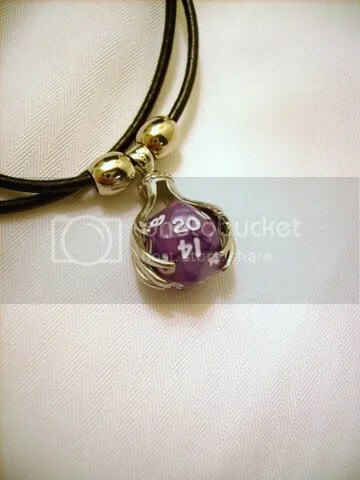 The die does not fall out of the clasp, and is held securely with just a little space for movement. The clear colours sparkle almost like real crystal when caught in the light. This particular die was actually part of a pair of earrings I made and owned. 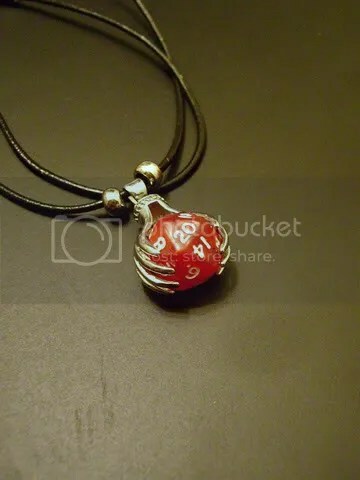 I lost the other half while I was travelling in Virginia visiting a WoW guildmate, and I just *had* to reuse it for something else, they were just too pretty to let go of. Also considering Koplow Games does not make transparent mini-d20’s anymore, it’s increasingly difficult to find them in retail. Or anywhere else for that matter.